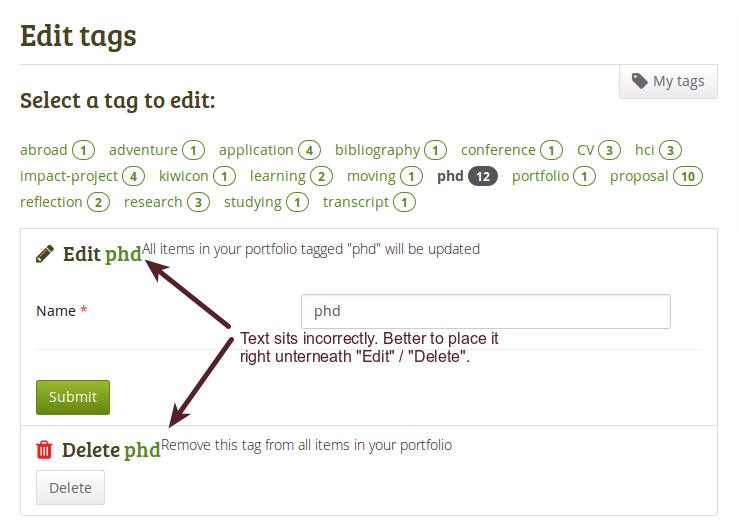 Align info text better on "Edit tags"
When you are on the edit screen for your tags, the info text for "Edit [tag]" and "Delete [tag]" needs to be aligned better. 1. (preferred): Below "Edit [tag]" and "Delete [tag]", but not below the image if possible so that the text is aligned with the text of the first line. 2. The info text gets bottom aligned with the heading and is separated by a "-" from the heading. In bug 1529714, a new tag called tag-action-description has been made in edittags.tpl, and has been given the properties of description text, and margins to give it good spacing in _tags.scss.